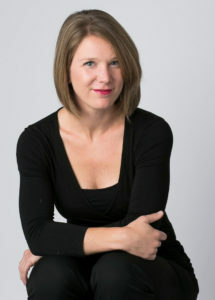 Pianist Marianne Parker is a founding member of the L+M Duo, which performs contemporary music for percussion and piano. Previously, she served as Principal Pianist of the Civic Orchestra of Chicago, where she studied under Chicago Symphony Orchestra Principal Pianist Mary Sauer. Ms. Parker previously studied at the Bösendorfer Piano Institute of Vienna under Krassimera Jordan, and with pianists Wei-Han Su, David Northington, and David Brunell. 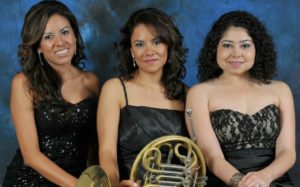 The Mulati Ensemble explores the rich musical heritage of Latin American music while commissioning and premiering new music with folkloric influences. Mulati also makes original arrangements of Latin American folk songs, and enjoys presenting a rich and neglected folk and classical repertoire to the Chicago area. In their practice, Mulati creates a unique environment full of color and energy that engages the audience. Tom Clowes is a Chicago-area cellist and Founder of Crossing Borders Music. Tom was a student of internationally acclaimed cellist Wendy Warner, former Detroit Symphony Orchestra Principal Cellist Italo Babini, and Lawrence University Conservatory of Music Professor Janet Anthony. As a member of the Civic Orchestra of Chicago, he played under conductors Riccardo Muti, Peter Oundjian, and Cliff Colnot. In the summers, he teaches at the Ambassadors Music Institute in Croix-des-Bouquets, Haiti. Before moving to Chicago, Tom was a member of the Tucson Symphony Orchestra. He teaches at the Chicago West Community Music Center of Garfield Park. Grammy-nominated sitarist Gaurav Mazumdar is one of the most sought-after and versatile musicians today. Growing up in a musical family, Gaurav first learned the violin before the legendary maestro Pt. 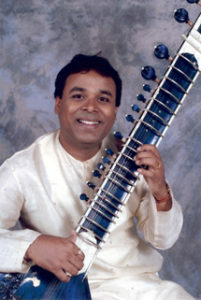 Ravi Shankar discovered Gaurav’s talent and inspired, taught, and guided him in learning the sitar. His jugalbandis (duets) with some of the best-known musicians of India from both the North-Indian (Hindustani) and South-Indian (Carnatic) traditions are a real treat for the listeners. He has had numerous collaborations with western musicians such as Daniel Hope, Philip Glass and Kenny Werner and composed for and performed with the English Chamber Orchestra. He is the only Indian to have performed at the Vatican. 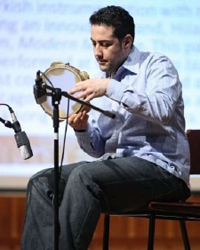 Born in Syria, percussionist Omar al Musfi began his musical training at a very young age. By the time he was ten, he had won several national competitions as an elementary school student. 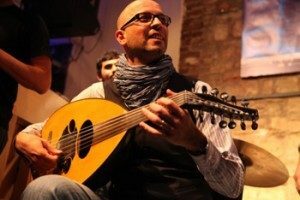 After graduating from the Syrian Conservatory of Music with a degree in percussion performance, al Musfi started performing extensively with the Syrian National Orchestra. Al Musfi has toured throughout the Middle East and North Africa, Europe, East Asia, and the United States. He has performed in prestigious venues such as the Kennedy Center, Symphony Center in Chicago, and at the Percussive Arts Society International Convention. He has collaborated with groups from a broad range of musical backgrounds, including classical, Middle Eastern and Fusion Jazz. Among them are the Chicago Symphony Orchestra, the Pacific Symphony Orchestra, Yo Yo Ma and the Silk Road Project, and contemporary pop artists such as Sting and Shakira, as well as many other groups representing a great diversity of styles. Issam Rafea, oud, is the Winner of the 2010 “Best Composer Award” in Dubai International Film Festival (Muhr Arab) for the film Matar Ayloul, “September Rain.” Rafea was the Chair of the Arabic Music Department at High Institute of Music in Damascus and the principal conductor of Syrian National Orchestra for Arabic Music. Rafea has studied under Fayez Zahr El-Din, Aref Abdallah, and Askar Ali-Akbar. In Syria, Rafea has been an active composer and arranger for TV and theater since the 90s. In addition to solo appearances with the Syrian National Symphony Orchestra, conducted by Solhi Al Wadi, Rafea has performed internationally in France, Spain, Germany, Holland, Italy, Morocco, Iraq, Lebanon, Egypt, Turkey, Kuwait and United States. He’s participated in the Mediterranean Festival in Algeria, the World Universal Expo in Seville, Spain, Spiritual Music Festival Marseille, France, The Arabic Music Conferences in Cairo, and Babel Festival in Iraq. Fahimeh Mehrabkhani is a talented vocalist with a warm, awe-inspiring voice. She was born in Iran and grew up in a musical community, beginning to perform at age 10. While instinctually she was quite proficient in signing Persian, she started learning Western classical and operatic styles as well. She has accompanied several Persian and Western-style ensembles and performed as the soloist in many concerts in Iran and in the United States. Furthermore, she has devoted many years of her life to teaching music to children and has participated in development of a number of famous children’s music materials published in Iran. Fahimeh is a graduate of the Bahá’í Institute for Higher Education and Northeastern University. See also our team of Teaching Artists!